This is a difficult ECG for a number of reasons, however straightforward if you use the ECG in 20 Seconds Approach. Are they upright in II and inverted in aVR? Yes-----This indicates a normal conduction. Is each P wave associated with a QRS? Maybe. There is a P wave for every QRS, HOWEVER, the PR interval varies. The P-P interval is constant, but the PR interval varies and THERE IS ONLY ONE P WAVE FOR EVERY QRS. There is no relationship between the atrial rate and the ventricular rate. 1.AV nodal Block- This is what we normal call a 3rd degree block, where there are more P waves than QRS's. In this situation the atrial rate is faster than the QRS rate. If the escape rhythm is junctional, then it's narrow, If it’s ventricular then the QRS is usually wider. 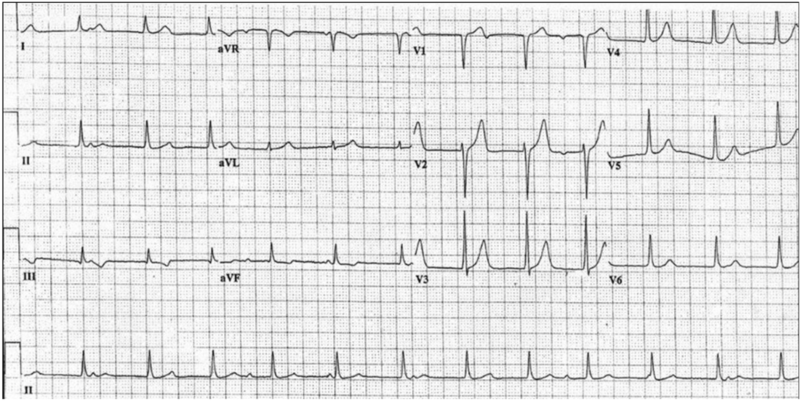 2.Accelerated lower pacemaker- Here the ventricular rate is faster than the atrial rate, which occurs in this ECG. If the QRS is narrow then it is junctional if wide, it is ventricular.